The Cuban In My Coffee: DIY Moroccan Wedding Blanket, Oh Yea! 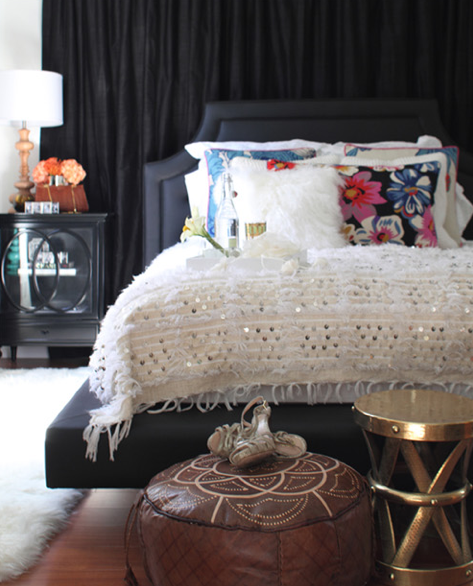 DIY Moroccan Wedding Blanket, Oh Yea! I've been very busy lately and in and out of town for personal business, but I have been dying to share with you a recent DIY project that I completed and I think many a fan will be VERY excited about this one. I'm talking about an easy DIY Moroccan wedding blanket using nothing more than trim and fabric glue! You heard me correct, I glued trim to an awesome blanket that I found and created a similar version to the costly crowd favorite at a much lower cost. 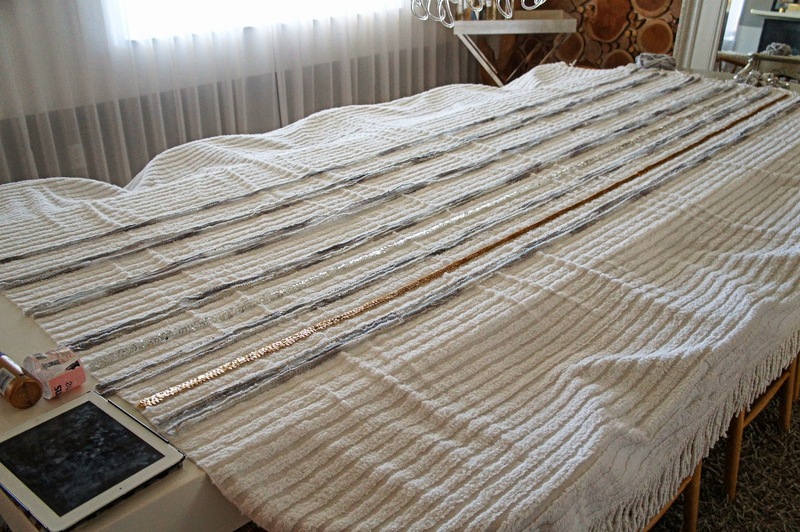 Here is my DIY Moroccan Wedding Blanket. Sequins and lamb's wool and cotton, Oh my! Let's take a look at where the obsession started. 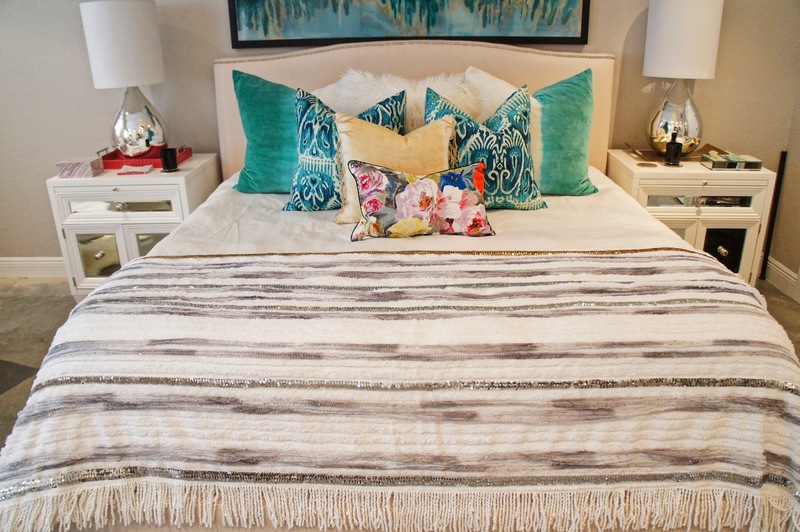 You can find these blankets in white or in shades of cream and with some color to them as well, and they all have the most amazing sequins and trim details. Here are some of my inspiration images which I used to drool over guide my DIY Moroccan wedding blanket. Moroccan wedding blankets are known as handira and are hand woven from cotton, wool and linen by Berber women and given to brides who wear them on their wedding day. They are said to ward off evil and to award fertility. These blankets are hand woven which you can imagine takes a lil bit of time and effort. They are gifted to the bride who wears them as a sort of cape for her journey home. Here is a close up of one I found on Ebay. How cool is that? As you would imagine, these hand woven babies can cost hundreds of $$$ and since I don't have any Berber women around weaving me one up I decided that I had to either pony up the cash, or figure out how to make one of my own which is exactly what I did. 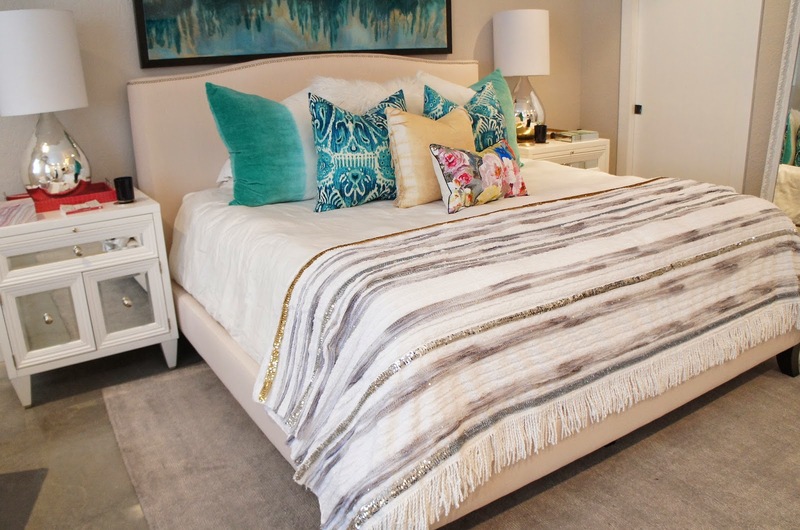 To start off with I needed to find a blanket, and preferably one with some texture to it so that it better resembles the natural texture of the woven handira or Moroccan wedding blankets. 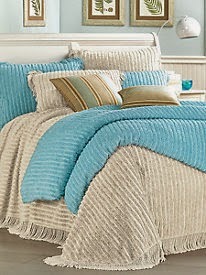 I found this lovely blanket from Linen Source in a size king for $89.95. You can find your own here. Total blanket cost $89.95 with free shipping. Next you have to get some trim. This can get expensive so measure wisely. For my blanket I decided to go with 3 types of trim, a gold sequin trim, a silver sequin trim and a yarn that I found on clearance for $2.00 per roll which was shades of grey with slight gold sequins in it. I decided after the fact to omit some of the gold which just didn't work in the space. You can see how this would be a costly mistake. Here is a close up of my trims. The tricky part is figuring out how many rows you will want to do. I found that each row needed 3.17yds of trim. As you see from the picture above I spaced them out by two rows for each sequin trim and one row in the middle of each yarn trim. You can do yours any way you like with as much or as little as you prefer. What you will need to know if how much of each trim you will need in total. - Patons Pirouette in Silver Sparkle that I happened to find on clearance at Joanne's crafts for only $2.99. I made 32 total rows of this which comes 17 yds. per pack which was a total usage of 5 packs. 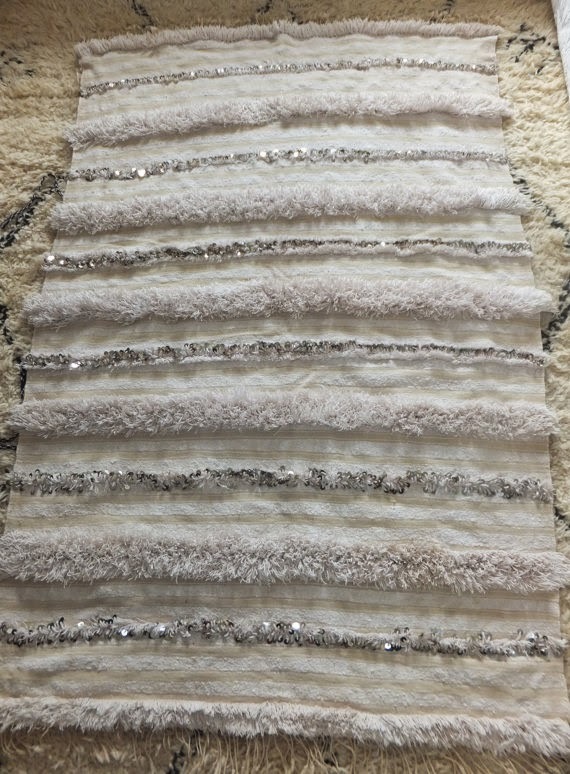 -7/8" silver stretch sequin trim for $3.99/yd. I used 10 total rows at 3.17yds per row which was roughly 32 yds. at $3.99 minus a discount coupon of 40% (oh yea!) for a total cost of around $76. 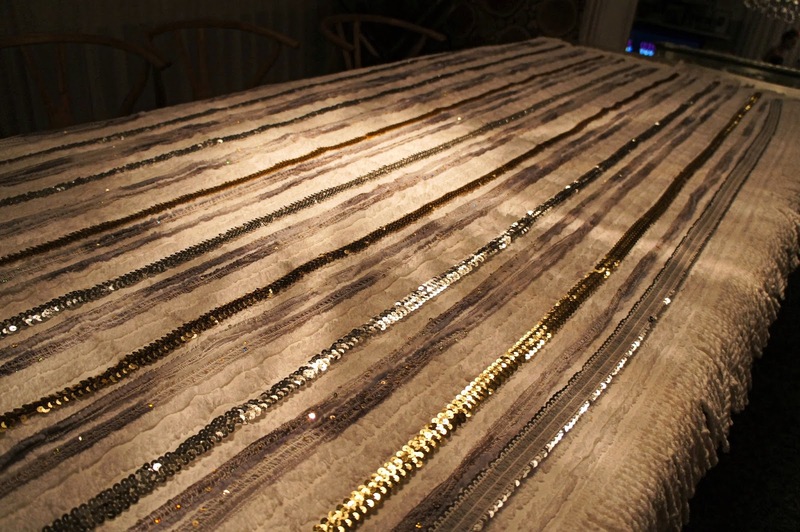 -7/8" gold stretch sequin trim for $3.99/yd. Same usage and cost as above. Next up is the easiest part of all, original tacky glue which is basically fabric glue. Do yourself the favor and get the mega large one, you'll need it. It's about $7.00 for 16oz. The only other thing you will need for this project is scissors. To actually make your blanket you will need some time, and patience. To begin you simply run your trim down the blanket and measure it. Cut it when it gets to the ends of the fuzzy raised part of the blanket just before the fringe. Once you have a few pieces measured, cut and laid out you simply run the glue down the length of the blanket and then come back over the glue with your trim pressing it down in to the glue. I found it easy for me to get a paper towel and run it over the entire strip to make sure that it was securely pressed evenly down the blanket. I also glued the trim directly on to the raised fuzzy part. Here I am in the beginning process to give you an idea. As you see, you will need some space for this one. That's it! Hours of labor and cutting, laying out and gluing aside you can stand back as I did and marvel at your new creation. This was a late night shot when I got to stand back and finally see it completed, and I just thought it was stunning! And here are a few shots of the room in it's progress with the new addition. 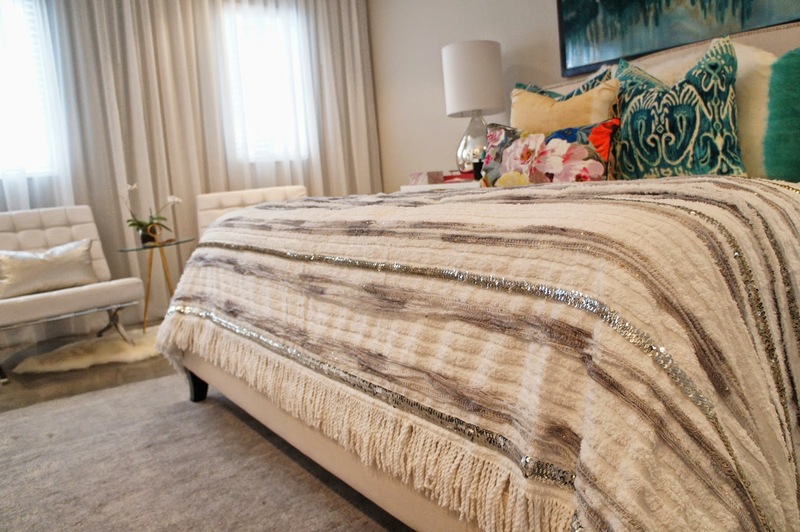 Now this is much less expensive than the $700-$800 dollar blankets in the larger sizes I wanted, though admittedly it wasn't exactly a "cheap" DIY it still brings a smile to my face when I walk in to my bright bedroom and see it sparkle. You could cut your own costs down by going with a smaller sized blanket which would in turn need less trim and less mullah $$. You could also shop around for trim and see what discounts you find. What I love about DIY is that there is a sense of instant gratification AND you get to tell a story about something. As an interior designer I LOVE THAT! It's not only about how much something costs, or where it comes from as much as it is the story of how a space comes together that makes it truly magical. I'm sure there will more changes as things progress such as with the accents and pillows until I'm truly happy with it (and when I'm finished rotating things from all over my house,) but for now things are shaping up nicely. I've just become absolutely obsessed with these. They're so gorgeous!! I've decided to make one for my bestie's wedding gift. Thanks for the tips. I'm doing something similar, but I love your combination of trims. Gorgeous! So glad I came across your blog! I've been wanting to buy one, but can't justify spending hundreds on one. I am totally DIY'ing it! Thank you so much for sharing!! 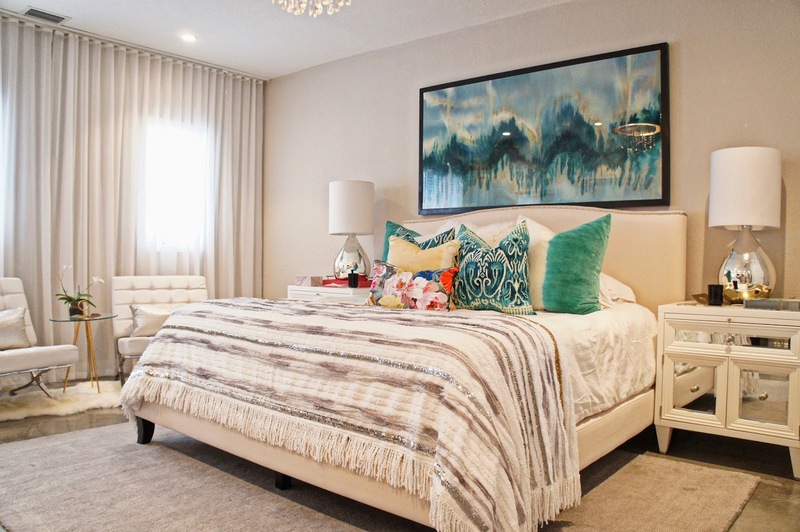 I LOVE, LOVE, LOVE your bedroom! It's absolutely gorgeous girl! Maybe you should of thought of using Fabrictac glue so that you could wash it if you ever needed to...you know accidents happen.